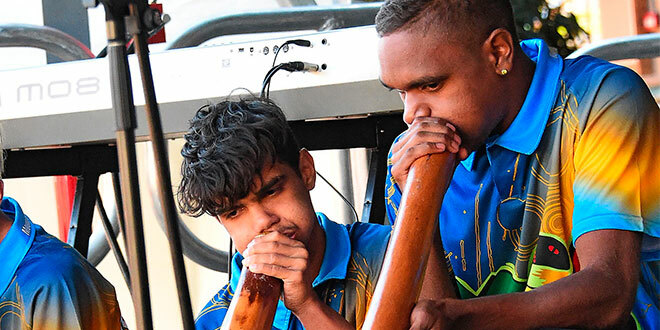 Games opportunity: Mount St Bernard College students Mathew Ederer (left) and Keane Ryan will be playing their didgeridoos at trhe Commonwealth Games opening ceremony on the Gold Coast. THE tyranny of distance could well have cruelled the opportunity of a lifetime for two indigenous boys from Herberton to perform in the opening ceremony of the Commonwealth Games on the Gold Coast in April. However, the performance aspirations of the senior students from Mount St Bernard College have been thrown a lifeline by a friend and former colleague of Cairns Catholic Education. To take part in the dream opportunity, Keane Ryan and Mathew Ederer, both 17, would be required to attend rehearsal sessions on the Gold Coast over a six-week period in the lead-up to the April 4 event. Such a long absence from their senior schooling would come at a damaging cost to their education, but now the boys will be able to attend school at St Edmund’s College, Ipswich, as well as realise their dream, thanks to principal Diarmuid O’Riordan and the St Edmund’s College community. Formerly the deputy executive director of Catholic Education Services in Cairns, Mr O’Riordan took up the position of principal at St Edmund’s last year to be closer to family. But his Far North Queensland Catholic Education family remains close to his heart. In a typical display of co-operation and support between Catholic school communities regardless of where they are located, Mr O’Riordan and Mount St Bernard College principal David Finch brokered an arrangement so that Keane and Mathew can continue their schooling at St Edmund’s, around rehearsals. Although only at the school for some of their time away, both principals view this as a tremendous opportunity to share cultures and open a dialogue between indigenous boarders at Mount St Bernard College and the students at St Edmund’s College. Mathew is a local Tablelands boy and Keane is from Santa Teresa in Central Australia. Both boys have been founding members of the Didge Kids and have been boarders at Mount St Bernard College since Year 8, and both are members of the college’s student leadership group this year. Mr Finch, members of Mount St Bernard’s transition team and the St Edmund’s College community are assisting with accommodation and chaperoning to make the opportunity a reality. Keane and Mathew are excited to have been selected for a role in the opening ceremony and grateful to those who are working hard behind the scenes to bring their dream to fruition. Both boys are seeking fundraising and sponsorship opportunities to assist with the costs involved to make this once-in-a-lifetime opportunity happen.